IN THE LONG HISTORY OF INTERNATIONAL FOOTBALL, a total of just 20 men can boast lifting the game’s ultimate prize. It is a particularly selective group of illustrious players, but of all those FIFA World Cup-winning captains, only one can claim to have done it on his landmark 100th cap. Perhaps more importantly, he did so at a time when his coveted footballing nation was at its lowest ebb. Fabio Cannavaro was Italy’s unlikely hero. The self-assured Italian insists that he always knew he was destined for a life in football. However, standing at a modest five feet nine inches, not many would have predicted a future as the world’s greatest defender. In fact, he even started his youth career as a right-midfielder; switching to centre-back during his teens would prove to be one of the most significant decisions in Italian sporting history. His unlikely rise to prominence began on the hardened streets of Naples, an economically-stricken city in the south of Italy where street football is king. In fact, life in this Italy’s third-largest municipality is so unique that its children are commonly branded Scugnizzo thanks to a distinct outside lifestyle that would normally be more synonymous with parts of South America. Rather than becoming a deterrent, though, that backdrop of the Mezzogiorno served as the perfect outlet for a young Cannavaro to equip himself with an arsenal of tools that would serve him greatly in later years. 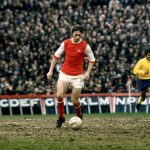 Equally significant was the success of his much-loved boyhood club Napoli, for whom, at 19, he would make his professional debut. Throughout its first six decades of existence, Napoli was a club boasting modest achievements within calcio. However, the arrival of Diego Maradona in 1984 would ignite an era of dominance that would light up an entire city as the club lifted two Scudetti, a third Coppa Italia, and a UEFA Cup. The young Cannavaro was fortunate enough not only to have these icons as his inspiration, he was additionally afforded the chance to experience those successes with them – gaining a taste for glory in the process. Cannavaro was a 12-year-old child when Maradona fired the club to its first-ever league title. He was not only present to see his idols celebrate their triumph, he was there on the Stadio San Paolo turf partying alongside them. At this point, he was just a ball boy basking in the glory of seeing his heroes unite a city. Two decades later, he would emerge as the man to amalgamate an entire nation. By the time Cannavaro made his debut in March 1993, Napoli’s glory years were well and truly over. The Maradona era had ended with a whimper when the shamed Argentine superstar departed for Spain in 1992 after completing a 15-month ban for drug abuse. I Ciucciarell were trapped in a downward spiral. On a personal level the upcoming defender continued to impress over the next two seasons and would be the subject of a bid from Parma in the summer of 1995. The financially-stricken Napoli had no choice but to sell their talented home-grown youngster. Cannavaro arrived at the Stadio Ennio Tardini at the tender age of 21, but he was already en route to becoming one of the game’s all-time greats. 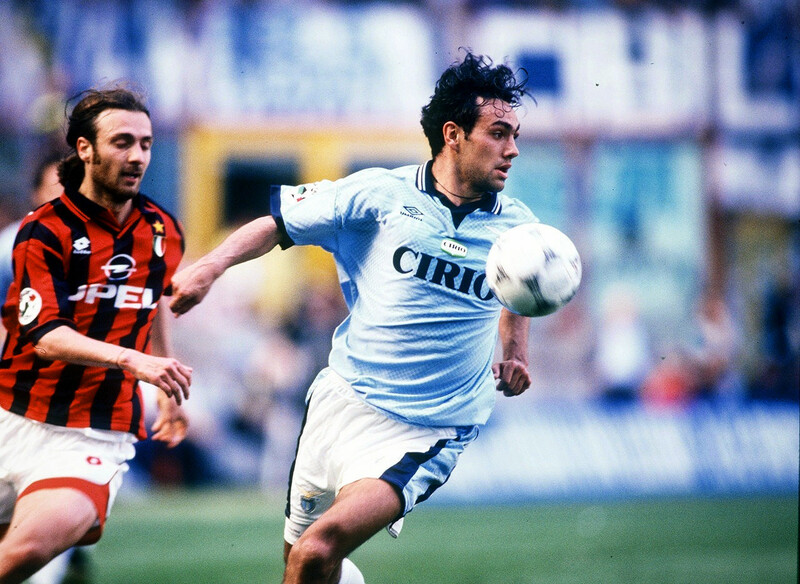 Whilst his childhood had been dominated by headlines surrounding the mercurial Maradona, the influence of fellow Napoli hero Ciro Ferrara had helped mould the quick-learning apprentice, who had acquired the leadership skills and astute understanding of the game to ensure a successful career. Meanwhile, a combination of fast acceleration and a salmon-like leap manifested as physical attributes capable of compensating for the perceived lack of height. Perhaps more crucially, growing up as a Scugnizzo had given Cannavaro an exterior made of steel that was only surpassed by the mental toughness needed reach the elite echelons of world football. Whilst Cannavaro’s early promise had been unmistakable at Napoli, it was at Parma where the defender really began to prove himself ready to become one of the sport’s top stars. In a back line also boasting the talents of Lilian Thuram and supported by future World Cup-winning teammate Gigi Buffon between the sticks, the Italian helped i Crociati form one of the tightest defensive units in European football. Those immense qualities at the heart of Parma’s formidable defence garnered plenty of plaudits and were rewarded with a first international cap against Northern Ireland in January 1997. Just one month later, thanks primarily to a defensive injury crisis, Cannavaro was promoted to the starting 11 by head coach Cesare Maldini for a crucial World Cup qualifier with England at Wembley. The unenviable task of marking a goal-hungry Alan Shearer, who had eight months previously landed the Golden Boot at Euro 96, could have easily overwhelmed even the most experienced of defenders. However, a master-class from the international novice helped contain Shearer and his Three Lions’ colleagues as the visitors claimed an impressive 1-0 victory. Cannavaro quickly established himself as a mainstay of Maldini’s side, playing in all five matches at the subsequent World Cup tournament in France. Though the central defensive partnership was ultimately disrupted by an injury to Alessandro Nesta, the seeds had been firmly planted for one of the sport’s most dominant central pairings to emerge. Italian football has always been synonymous with highly organised, authoritative, economical back-lines, and the duo of Cannavaro and Nesta would epitomise that sentiment for the best part of a decade. There would be plenty of heartache along the way, most notably David Trezeguet’s Golden Goal dagger in the final of Euro 2000, but Gli Azzurri wouldn’t have to wait too long before exacting their revenge on France to reach the sport’s pinnacle. 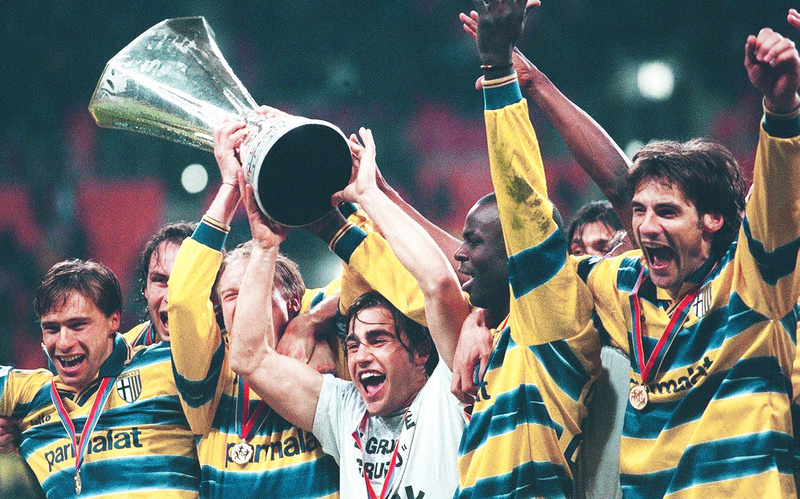 At club level, meanwhile, Cannavaro enjoyed successful times at Parma, lifting two Coppa Italias and a UEFA Cup before transferring to Inter Milan for an astronomical €23 million in 2002. That summer would be hugely significant for the Neapolitan defender who inherited the national team captaincy from the retiring Paolo Maldini, and would initiate the beginning of an era in which he would cement his name amongst the football Gods. Just six days before his 29th birthday, Cannavaro lead Italy to a 2-0 away win over Azerbaijan in his first competitive match as skipper. Coincidentally, his first home qualifier as captain saw the defender return to the Stadio San Paolo, where he naturally received a standing ovation. The King of Naples was well on his way to becoming an Italian icon. Cannavaro’s progress at Inter Milan was stuttered to say the least, which was mirrored by a disappointing Euro 2004 campaign that saw an unbeaten Azzurri side cruelly eliminated at the group stage by a virtue of goal difference. Fortunately a 2004 move to Juventus, which saw the Italy skipper reunite with former Parma team-mates Buffon and Thuram as well as ex-Napoli idol Ferrara, would spark a dramatic upturn in Cannavaro’s club career. 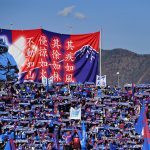 The Italian centre-back played an omnipresent starring role as the Turin giants claimed the Serie A crown in his inaugural campaign at the Stade delle Alpi. He then missed just two matches as the club successfully defended their title the following year. Juventus would be subsequently stripped of their medals thanks to their part in the infamous calciopoli scandal; nonetheless, this was a side of genuine star quality and their number 28 stood out as the real diamond – as was demonstrated by the fact he was named Defender of the Year in both seasons. In fact, weeks before the 2006 World Cup, Cannavaro also picked up both the Italian and Serie A Football of the Year awards, underlining his incredible contributions. Regardless of those problems for Italian football off the pitch, their skipper was entering the tournament at the peak of his powers on it. Still, nobody could have predicted the superhuman leadership that was about to rock the entire planet. Marcello Lippi’s squad undoubtedly carried real talent but Italy were considered outside shots at best. Moreover, the recent corruption scandal had turned millions of neutrals against the shamed nation and the Azzurri were set to take the full brunt of that global antipathy. However, the Italians remained unperturbed by off-field politics and were absolutely sublime on the pitch. A 2-0 opening victory over Ghana would set the tone for what would be an immensely productive tournament for Lippi’s men, as unrivalled squad harmony helped them en route to topping Group E with seven points, drawing 1-1 with the United States before triumphing 2-0 in the final game against Czech Republic. The brave mentality of a squad that could have easily crumbled under the circumstances was best reflected by their uncharacteristically forward-thinking mentality. For decades, Italian success has been built upon a strong emphasis of disciplined defence, but Lippi placed a huge focus on the offensive third with Francesco Totti supporting the rotating partnerships formed by Luca Toni, Vincenzo Iaquinta, Alberto Gilardino and Alessandro Del Piero. Furthermore, the attack-minded full-back pairing of Gianluca Zambrotta and Fabio Grosso added another dimension to the Italians’ play. Despite that increased focus on hurting the opposition, Italy looked almost impenetrable at the back thanks primarily to the relentless authority of their skipper. In fact, the only goal conceded in the group stage came courtesy of a freak Cristian Zaccardo own goal. Lippi’s side were heading to the knockouts with expectations slowly rising. Italy’s progress wasn’t without hiccups, though, as Nesta’s personal heartache was repeated for a third straight World Cup as he limped out of the final group game with another tournament-ending injury. In the absence of his defensive partner, the responsibility on Cannavaro to marshal his backline was amplified tenfold but the 32-year-old was more than ready to answer his nation’s call. 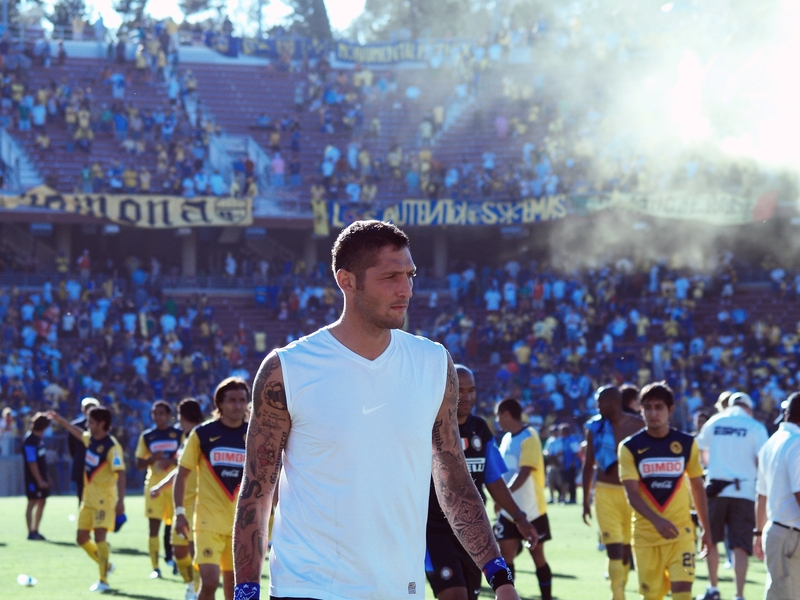 Four years previously, Marco Materazzi had failed to perform while deputising for the injured Nesta and was pinpointed as one of Italy’s worst players at the 2002 edition in Japan and South Korea. However, the Inter Milan defender made an instant impact in Hamburg by netting the opener against the Czech Republic less than 10 minutes after replacing Italy’s luckless number 13. Under the guidance of his inspirational captain, the stand-in defender would form a virtually unbreakable partnership at the heart of defence throughout the remainder of the tournament and both men would play a crucial part in the biggest game of their lives on July 9, 2006. Before booking their date with destiny, Italy had to first overcome a spirited Australia via Totti’s last-gasp penalty in the last-16. Zambrotta’s sixth-minute opener then set the tone for a comfortable quarter-final as Lippi’s men cruised past Ukraine to set up a mouth-watering semi-final encounter with host nation, Germany. That match in Dortmund would arguably be the greatest performance of Cannavaro’s entire international career. A stereotypically efficient German side, who hit an impressive 11 goals on their way to the last four encounter, were strongly fancied to find a route to the Berlin final. Nobody had accounted for the heroics of Italy’s herculean skipper. Predictably, the hosts tried to assert themselves from the outset but the brilliant Cannavaro dealt with that pressure with upmost composure to help limit Germany throughout. Die Mannschaft, along with the majority of fans inside Signal Iduna Park, grew impatient as they continually failed to pierce through the resolute Italy defence as the match remained goalless and went to extra-time. The Italians grew during the additional 30-minute period and eventually found the breakthrough as Grosso converted Andrea Pirlo’s defence-splitting pass just 60 seconds from time. The stadium fell silent, apart from the corner of jubilant Azzurri fans who could scarcely believe their eyes. As a desperate home side took one last roll of the dice, the colossal Cannavaro raced out to head the ball clear from danger in a moment that exemplified each of his enviable attributes to perfection. Twelve seconds later, an ecstatic Del Piero wheeled away having cemented Italy’s place in the tournament’s showpiece final. Italy were on their way to Berlin having conceded just one goal in six World Cup matches. 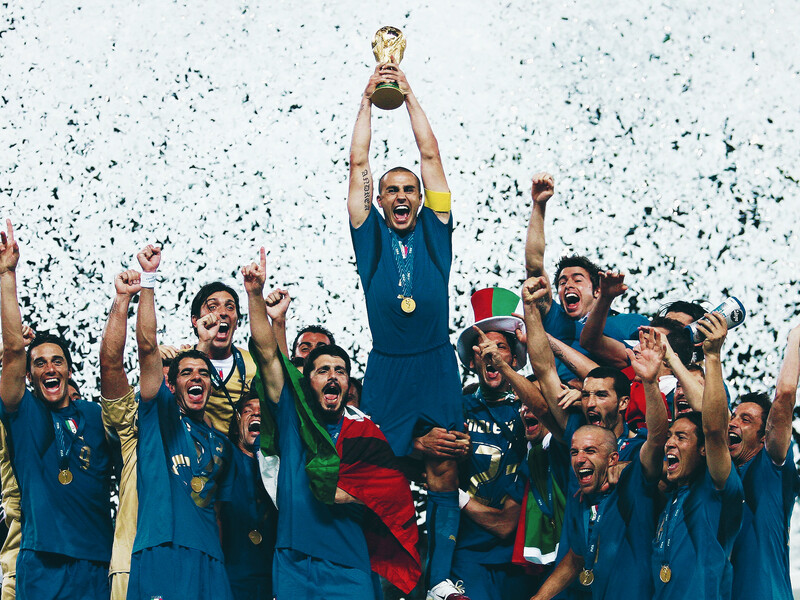 For all of their attacking endeavours, that defensive stability had been fundamental during their journey to the final and Cannavaro’s stunning man of the match display against Germany served as a fitting microcosm for Gli Azzuri’s tournament as a whole. Fate would afford Italy the chance to avenge their Euro 2000 final defeat as France beat Portugal in the second semi-final just 24 hours later. More importantly, in the wake of the calciopoli scandal, it also offered a proud football nation an unrivalled opportunity to gain reconciliation with football. The World Cup final would naturally provide a standout occasion for every player involved but a centenary cap, as captain, guaranteed that this would be Cannavaro’s most important game, regardless of the outcome. That said, the Italy skipper wasn’t the main focus of media attention during the build-up: the headlines belonged exclusively to Zinedine Zidane. Unquestionably the most gifted footballer of his generation, France’s decorated captain had already announced his impending retirement. After successfully leading Les Bleus to the final with a string of heroic performances that could only be matched by Cannavaro, Zidane’s swansong would come on the grandest stage of them all. His exit from the game would provide the most iconic sporting moment of the decade. Perhaps quite presumably, Zidane struck the real first blow in Berlin by nonchalantly chipping a seventh-minute penalty off the underside of the crossbar to fire the 1998 winners into the lead. That advantage wouldn’t last long, however, as Materazzi secured redemption for conceding the earlier spot-kick with a thumping header just before the 20-minute mark. Despite the fast-paced nature of those opening exchanges, the final was, whilst absorbing, devoid of many other scoring opportunities. As Italy’s attempts of expansive play found minimal impact, French attacks were equally unsuccessful as Cannavaro’s army extinguished the threat of conceding further ground. The Azzurri’s defensive triumphs were verified in extra-time as an exhausted Thierry Henry was withdrawn after running himself out of steam in an anxious attempt to get the better of the Italian warrior. Likewise, an equally frustrated Franck Ribéry suffered a similar fate, while even Zidane failed to gain any real foothold in the attacking areas. The scores were still level, but Cannavaro and co. were winning the battle of minds and French aggravation would manifest in explosive fashion just minutes later as the two goal-scorers embroiled in one of the World Cup history’s most shocking scenes. An entire sport was rocked as a seemingly innocuous exchange of words between the two players ended with Zidane’s inexplicable headbutt to Materazzi’s chest. That incomprehensible reaction left referee Horacio Elizondo no choice but to brandish the red card; with that a football legacy had concluded in the most shameful of circumstances. As Zidane trudged past the trophy and departed a professional pitch for the last time, a legend was finished. However, 10 minutes and nine penalties later, another had been cemented as Cannavaro had accomplished the unimaginable. Italy had been transformed from a shamed footballing nation into world champions. For his starring role, the Azzurri captain would forever be immortalised by the nickname Il Muro di Berlino – The Berlin Wall. Having won the World Cup after conceding just two goals, Italy had equalled a record set by France eight years earlier. The skipper was named runner-up, coincidentally behind Zidane, in the Player of the Tournament awards and had sealed his place as the planet’s greatest defender. Cannavaro and the squad returned to Rome as Gods, but the fallout of the aforementioned scandal meant that club side Juventus had been demoted to Serie B. That sparked an exodus of players, with the World Cup-winning captain choosing Real Madrid as his next destination. He would help Los Blancos to two Liga titles during a three-year stay at the Bernabéu before returning for one final season in Turin in 2009. After Italy’s spectacular implosion at World Cup 2010, the 36-year-old would retire from international football as his country’s most capped outfield player with 136 appearances to his name. He would also leave Juventus once more to end his career with Qatari side Al Ahli, only to be forced into retirement soon after thanks to a problematic knee injury. Nevertheless, Cannavaro retired a true legend of the game. His standing as the generation’s most accomplished centre-back was underlined as he claimed the 2006 FIFA World Player of the Year award, becoming the only defender to ever acquire that title. On November 9, 1989, East and West Germany were unified by demolition of the Berlin Wall. On July 9, 2006, Italy’s home-grown Muro di Berlino stood firm to signal a national reconciliation of its own. Moreover, he had done so by re-establishing Italian football’s notoriety for world-class defending.